Child custody and child support are major areas of the comprehensive legal services offered by Jim Williams & Associates to our clients in Tennessee and Virginia. Child custody and child support are particularly sensitive areas due to the importance of children and their overall best interest and well being. Issues surrounding children, particularly custody and support issues, can be some of the most contentious legal issues an individual will face. It is important that you understand what the law says about these issues, how child support is calculated and how courts make decisions about parenting time. When parents cannot agree on custody of their child, the court will make a custody determination based on “the best interests of the child.” Determining the child’s best interests involves many factors, no one of which is the determining factor. The issue of child support is often contentious due one parent not wanting to pay child support to the other parent. It is important to know that most states have adopted child support guidelines and to have a clear understanding of those guidelines. Although some states base child support on the payor’s income, many states use an income shares model, which is based on the income of both parents, and the actual parenting time spent by each parent with the child. 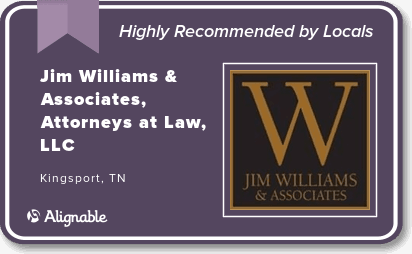 The attorneys at Jim Williams & Associates have helped numerous families throughout Tennessee and Virginia with child custody and child support matters. These areas require a compassionate yet professional attorney capable of clearly explaining the laws and your options during the often confusing process of negotiating and litigating a child custody or child support dispute. We assist clients on all issues related to child custody and support from parties going through a divorce as well as parties who were never married to each other. In cases where parties have a child, but were never married, it is important that paternity be established and a visitation scheduled and child support set as soon as possible so that each parent is taking an active role in their child’s life through visitation and support. At Jim Williams & Associates, we are proud of our reputation among both clients and peers for our fair and creative strategies for dispute resolution. In our experience, a negotiated settlement will often provide for more flexible and creative solutions than those offered by the courts. In addition, there is little of the resentment that often accompanies a court-imposed solution when both parties voluntarily enter into a mediated settlement agreement. However, we are trial lawyers representing clients in all courts in Tennessee and Virginia. We are never intimidated by the prospect of litigation, especially when it becomes necessary to achieve the legal goals of our client. A child custody or child support matter is a difficult and emotional time for all parties involved. You will have many questions and we will be able to provide the answers. Please CONTACT one of our lawyers at our downtown Kingsport office located at 324 Cherokee St. for a FREE consultation and case evaluation from an experienced child custody and child support attorney.